just as unstable, unpredictable, and dangerous as the concoctions he brews. poisons, explosives, and all manner of self-transformative magic. liability and risk for most civilized organizations and institutions of higher learning, seem to fit quite well with most adventuring groups. Starting Wealth: 3d6 × 10 gp (average 105gp.) In addition, each character begins play with an outfit worth 10 gp or less. The alchemist’s class skills are Appraise (Int), Craft (any) (Int), Disable Device (Dex), Fly (Dex), Heal (Wis), Knowledge (arcana) (Int), Knowledge (nature) (Int), Perception (Wis), Profession (Wis), Sleight of Hand (Dex), Spellcraft (Int), Survival (Wis), Use Magic Device (Cha). The following are class features of the alchemist. Weapon and Armor Proficiency: Alchemists are proficient with all simple weapons and bombs. They are also proficient with light armor, but not with shields. gains a competence bonus equal to his class level on the Craft (alchemy) check. 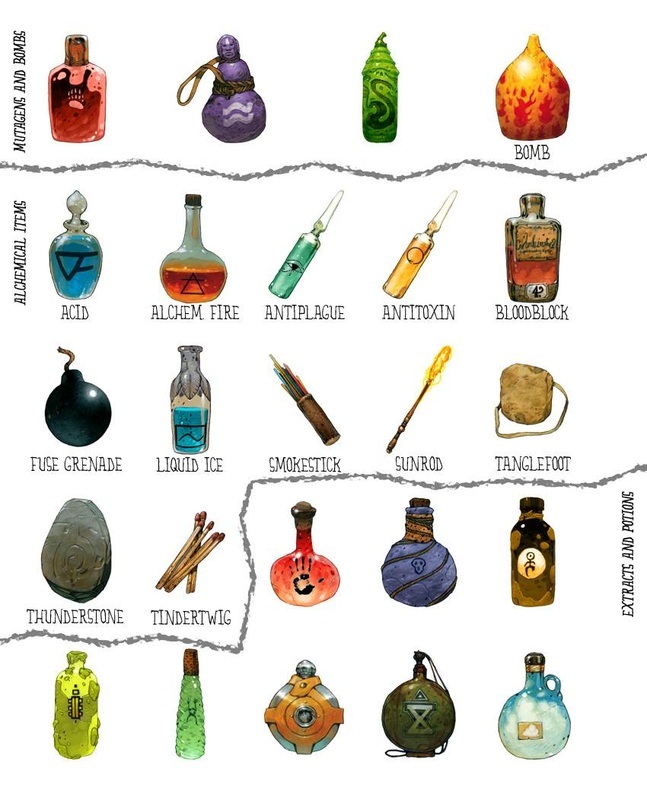 An alchemist can create three special types of magical items—extracts, bombs, and mutagens are transformative elixirs that the alchemist drinks to enhance his physical abilities—both of these are detailed in their own sections below. Extracts are the most varied of the three. In many ways, they behave like spells in potion form, and as such their effects can be dispelled by effects like dispel magic using the alchemist’s level as the caster level. Unlike potions, though, extracts can have powerful effects and duplicate spells that a potion normally could not. An alchemist can create only a certain number of extracts of each level per day. His base daily allotment of extracts is given on Table: Alchemist. In addition, he receives bonus extracts per day if he has a high Intelligence score, in the same way a wizard receives bonus spells per day. When an alchemist mixes an extract, he infuses the chemicals and reagents in the extract with magic siphoned from his own magical aura. An extract immediately becomes inert if it leaves the alchemist’s possession, reactivating as soon as it returns to his keeping—an alchemist cannot normally pass out his extracts for allies to use (but see the “infusion” discovery below). An extract, once created, remains potent for 1 day before becoming inert, so an alchemist must re-prepare is extracts every day. Mixing an extract takes 1 minute of work—most alchemists prepare many extracts at the start of the day or just before going on an adventure, but it’s not uncommon for an alchemist to keep some (or even all) of his daily extract slots open so that he can prepare extracts in the field as needed. Although the alchemist doesn’t actually cast spells, he does have a formulae list that determines what extracts he can create. An alchemist can utilize spell-trigger items if the spell appears on his formulae list, but not spell-completion items (unless he uses Use Magic Device to do so). An extract is “cast” by drinking it, as if imbibing a potion—the effects of an extract exactly duplicate the spell upon which its formula is based, save that the spell always affects only the drinking alchemist. The alchemist uses his level as the caster level to determine any effect based on caster level. Creating extracts consumes raw materials, but the cost of these materials is insignificant—comparable to the valueless material components of most spells. If a spell normally has a costly material component, that component is expended during the consumption of that particular extract. Extracts cannot be made from spells that have focus requirements (alchemist extracts that duplicate divine spells never have a divine focus requirement). An alchemist can prepare an extract of any formula he knows. To learn or use an extract, an alchemist must have an Intelligence score equal to at least 10 + the extract’s level. The Difficulty Class for a saving throw against an alchemist’s extract is 10 + the extract level + the alchemist’s Intelligence modifier. An alchemist may know any number of formulae. He stores his formulae in a special tome called a formula Book. He must refer to this book whenever he prepares an extract but not when he consumes it. An alchemist begins play with two 1stlevel formulae of his choice, plus a number of additional forumlae equal to his Intelligence modifier. At each new alchemist level, he gains one new formula of any level that he can create. An alchemist can also add formulae to his book just like a wizard adds spells to his spellbook, using the same costs and time requirements. An alchemist can study a wizard’s spellbook to learn any formula that is equivalent to a spell the spellbook contains. A wizard, however, cannot learn spells from a formula book. An alchemist does not need to decipher arcane writings before copying them. of catalyst vials at the start of the day equal to the total number of bombs they can create in that day—once created, a catalyst vial remains usable by the alchemist for years. feats such as Point-Blank Shot and Weapon Focus. On a direct hit, an alchemist’s bomb inflicts 1d6 points of fire damage + additional damage equal to the alchemist’s Intelligence modifier. 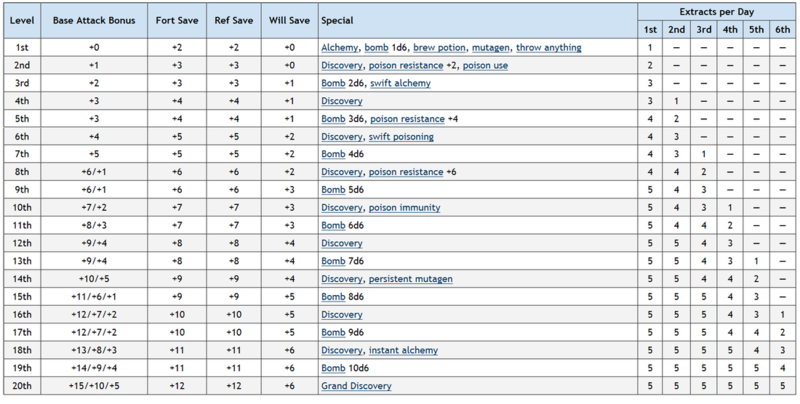 The damage of an alchemist’s bomb increases by 1d6 points at every odd-numbered alchemist level (this bonus damage is not multiplied on a critical hit or by using feats such as Vital Strike). Splash damage from an alchemist bomb is always equal to the bomb’s minimum damage (so if the bomb would deal 2d6+4 points of fire damage on a direct hit, its splash damage would be 6 points of fire damage). Those caught in the splash damage can attempt a Reflex save for half damage. The DC of this save is equal to 10 + 1/2 the alchemist’s level + the alchemist’s Intelligence modifier. Alchemists can learn new types of bombs as discoveries (see the Discovery ability) as they level up. An alchemist’s bomb, like an extract, becomes inert if used or carried by anyone else. At 1st level, alchemists receive Brew Potion as a bonus feat. An alchemist can brew potions of any formulae he knows (up to 3rd level), using his alchemist level as his caster level. The spell must be one that can be made into a potion. The alchemist does not need to meet the prerequisites for this feat. of mutagen, and once brewed, it remains potent until used. An alchemist can only maintain one dose of mutagen at a time—if he brews a second dose, any existing mutagen becomes inert. As with an extract or bomb, a mutagen that is not in an alchemist’s possession becomes inert until an alchemist picks it up again. it applies a penalty to his Charisma. A non-alchemist who drinks a mutagen must make a Fortitude save (DC 10 + 1/2 the alchemist’s level + the alchemist’s Intelligence modifier) or become nauseated for 1 hour—a non-alchemist can never gain the benefit of a mutagen, but an alchemist can gain the effects of another alchemist’s mutagen if he drinks it. (Although if the other alchemist creates a different mutagen, the effects of the “stolen” mutagen immediately cease.) The effects of a mutagen do not stack. Whenever an alchemist drinks a mutagen, the effects of any previous mutagen immediately end. any. This bonus damage is already included in the bomb class feature. alchemist’s level + the alchemist’s Intelligence modifier. At 2nd level, an alchemist gains a +2 bonus on all saving throws against poison. This bonus increases to +4 at 5th level, and then again to +6 at 8th level. At 10th level, an alchemist becomes completely immune to poison. 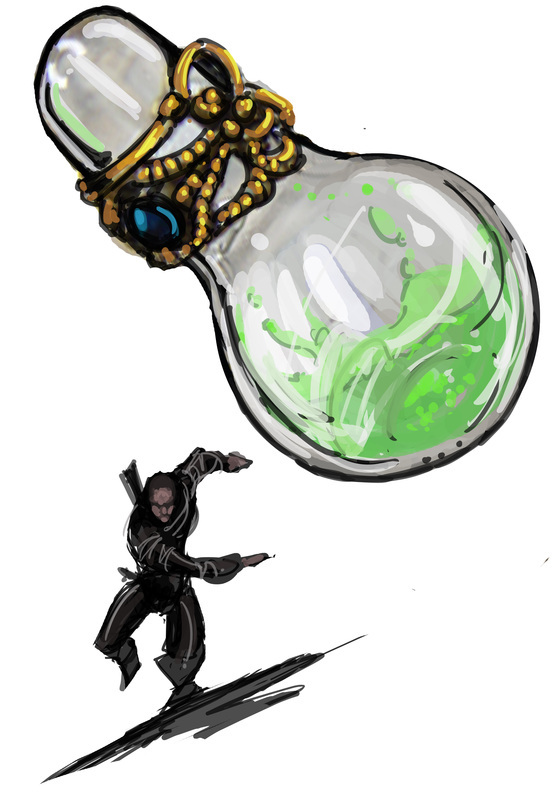 Alchemists are trained in the use of poison and starting at 2nd level, cannot accidentally poison themselves when applying poison to a weapon. At 3rd level, an alchemist can create alchemical items with astounding speed. It takes an alchemist half the normal amount of time to create alchemical items, and he can apply poison to a weapon as a move action. At 6th level, an alchemist can apply a dose of poison to a weapon as a swift action. At 14th level, the effects of a mutagen last for 1 hour per level. discoveries, but also learns a third discovery chosen from the linked list below, representing a truly astounding alchemical breakthrough of significant import. For many alchemists, the promise of one of these grand discoveries is the primary goal of their experiments and hard work.